HomeThe Garden of Earthly Delights. At least that’s its name this century. The Garden of Earthly Delights. At least that’s its name this century. Last week I began a new, hopefully, weekly bit of a challenge and cultural growth posting called “Guess That Art!” In this challenge you’re not to cheat but to see if you know what it is and comment, comment about what you think of the art, and even write a piece of poetry inspired by the art and share it through a link in the comments. The first panel is a scene of the Garden of Eden and most often interpreted as the moment God introduced Eve to Adam who is just coming awake from his surgical procedure. Click the link to go to an enlarged view of the panel that you can see the details and interpret the symbolism of the artists imagery. The man had a serious opinion about some things it would seem. Click here to see the first panel. The second or middle panel is similar to the first panel with the continuation of the horizon and terrain. It might even be possible that the second is future of the first when you look deeper. There is an obvious air of sexuality in the middle panel and thoughts have been it is a warning of where the world is heading. You get a feeling of condemnation from it and when you look at many of the individual scenes it becomes apparent what he may have thought. The large pink tower in the upper left corner is one that I was a bit surprised by. Click here to see the middle panel. 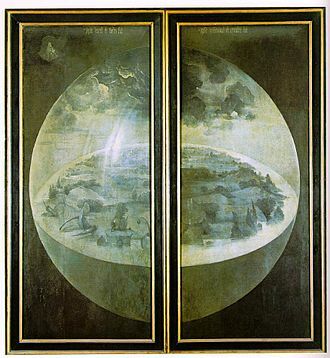 The third panel is the result of what Bosch saw as humanity’s wild forays into indiscriminate selfish pleasure. This is either a Hell on Earth or actual Hell. I especially find the pig nun disturbing. Click here to see the middle panel. What are you thoughts and interpretations? Share in the comments. Friday I will be sharing another work that I came across during some research. Here is what the work looks like when the panels are closed. If you look closely you will see what is thought to be God in the upper left corner looking down on earth as light is first appearing over Earth. I enjoyed this post and am looking forward to the next one!